DMJ & Co., PLLC participated in the Triad Chill on Saturday, February 25. The event marks DMJ’s 17th consecutive Polar Plunge and raised more than $13,500 for the nearly 40,000 athletes of Special Olympics North Carolina. DMJ was again awarded “Most Money Earned” by a group. The North Carolina accounting and wealth management firm was also recognized for its significant contributions to Special Olympics North Carolina, now raising more than $150,000 for the organization since its inaugural Polar Plunge in 2000. 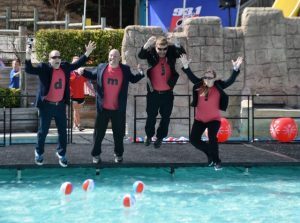 DMJ’s 2017 team of polar plungers included firm accountants Ginger Quick, CPA (Sanford), David Mize, CPA (Greensboro), and Chuck Carrick, (Greensboro) of DMJ Wealth Advisors (as pictured). Despite the balmy outside temperatures, the water temperature was quite chilly. The firm noted that more than 150 individuals, clients, and community members donated to Team DMJ’s efforts and to Special Olympics. Their generosity is credited with the firm’s longevity in fundraising, many of whom graciously share personal stories and experiences of how Special Olympics has made a personal impact. Special Olympics North Carolina represents more than 38,000 athletes and supporters and provides year-round sports training and competition opportunities for children and adults with intellectual disabilities.